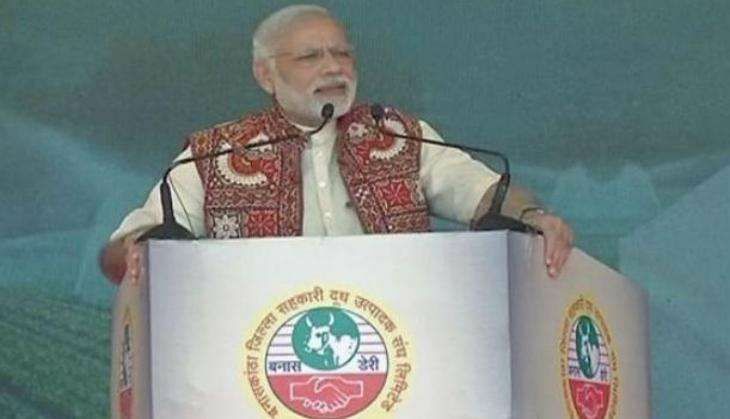 Prime Minister Narendra Modi visited Deesa town of North Gujarat on 10 December to address a public rally of farmers. He also inaugurated an Amul cheese plant in the town. Charging the Congress with looting the common man for 70 years, PM Modi said his fight for the poor would continue. There is no need to waste your time standing outside banks or ATMs, e-wallets have brought banks to your mobiles. I want to assure the people of the country that no one will be spared. You must have seen how bank officials and others who have stashed huge amount of black money are being caught. They thought they can escape through back channels but they didn't know that Modi has installed cameras in the back channels as well. Merely talking about the poor is different from working for the poor, something that the NDA government is always doing. Happenings in Parliament anguished our President, who has tremendous political experience. From the land of Mahatma Gandhi and Sardar Patel I want to share something with my friends in the Opposition. Government has always said we are ready to debate. I am not being allowed to speak in Lok Sabha so I am speaking in the Jan Sabha. I support honest people and therefore they are being instigated by many, even then people have welcome the move. For 70 years honest people have been looted and troubled. It has been difficult for the honest to survive. Terrorists get their strength by using counterfeit currency. Everyone is aware of the situation at the border. 100 rupee note had no value earlier but since 8 November everyone understands the value of 100, 50 and 20 rupee notes. This move is to empower the poor. The cheese of Amul brand is very popular worldwide. Other than 'Shwet Kranti', there is also a 'Sweet Kranti.' People are being trained in honey products. The farmers here turned to dairy and animal husbandry. This was beneficial for the farmers. Earlier, due to drought farmers committed suicide but changes took place and farmers adopted livestock leading to white revolution. The farmers in Banaskantha heard my request and embraced drip irrigation. This changed their lives and lives of future generations. When I took over as Chief Minister, I would tell farmers that you need to focus on water as much as you focus on electricity. There was a time when people from Kutch & Banaskantha would leave their homes in search of better opportunities. It is not the case now. Today, I have come before you not as a prime minister but as son of this earth.